Home » Film » Armageddon Lucky? When we are stripped of our artifice and rendered bare souls no longer hidden behind societal constraints or cultural norms, only then are we our genuine self. For some folks, an hour without electricity or a rough day at the office is enough to unleash the truths that hide inside, which is apparently most often a desire to smash windows or go on a sexual rampage. But for most of us, it would take something huge to convince us to drop the acting job that is our public persona…something like, say, a 70-mile wide asteroid. Writer/director Lorene Scafaria’s “dramedy” Seeking a Friend for the End of the World doesn’t really earn the last half of that mashed-up word, on account of not being particularly funny. Any chuckle opportunity has already been shown to you in previews, and the content after the first act is as laugh-free as an episode of “Whitney.” It’s also borderline brilliant…Seeking a Friend, that is, not “Whitney.” This is because Scafaria presents the truest, deepest character study imaginable: one where everybody is real because there is no point being fake. Seconds after Dodge (Steve Carell) and his wife Linda (Nancy Carell) hear a broadcast that confirms the mission to stop the planet-killing asteroid failed and they have 3 weeks to live, she bolts. With a look of disgust and pity, she literally runs from her marriage, leaving the straight-laced insurance salesman to die alone, which is exactly what he married her to prevent. Dodge finds no comfort in the Caligula-esque debauchery of others, like his friends Warren (Rob Corddry) and Diane (Connie Britton), who host a heroin-fueled gathering in which toddlers are encouraged to drink martinis. He is inconsolable and alone. Meanwhile, Penny (Keira Knightley), who lives in Dodge’s building, has split with her latest Mr. Wrong and seeks solace right outside of Dodge’s apartment. The two strike up an uneasy conversation built on mutual desperation that stems from neither having found love. She reveals she has “accidentally” received Dodge’s mail and she failed to pass it along. In said mail was a letter from Dodge’s high-school sweetie, professing her continued love. As riots swell, Dodge promises Penny he can find her a plane to get home if she will drive him to find his long-lost love. Road trip, apocalypse style! Cynics have lambasted the final act as cliched and unearned when it is neither. 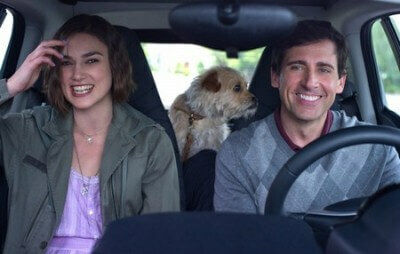 Carell and Knightley delicately reveal the kind of truths that fuse two souls together. He confesses about his broken family, romantic failures and general cowardice. She expresses her unrealistic desire for a transcendent romance. They don’t have the option of saving the world but have just enough time to save each other. Things get wobbly whenever Scafaria switches gears, as the transitions are hella clunky. But this is one heartfelt ride, as the film provokes the best kind of discussions. This isn’t a simplistic “carpe diem” movie; this is the kind of film that leaves you asking what is important to you and why. Risky, slightly jumbled and shockingly moving, Seeking a Friend is one-of-a-kind and kind of brilliant.